Ghat did not seem to be a good place to travel to Niger via Algeria, so we decided to return to Sebha to get more information about the conveys going to Dirkou. The advice was that we should go to Al Gatrun and wait there for the trucks going to Niger. Arriving in Al Gatrun, little more than a desert village with one filling station and a Niger consulate we soon met Mohammed Tager of the Wadi Alhikma Travel & Tourism Agency (Tel/Fax: 0735-2901). He ran a camping ground in the old Italian Fort which is very nice. Mohammed offered to organise guides for Chad ($600) or Niger ($400). This was much too expensive for us so we decided to do it our own way. We went to Tajarhi, 80km south of Gatrun to wait there for the convoys that did not come. The only traffic was Niger-bound smugglers passing through at night. We waited patiently in Tajarhi for four days during which time we got talking with people in the village. We met some Toubous who were planning to drive to Niger with four Toyotas. They were smuggling stuff that they get almost for free from the government: rice, flour, diesel. We also saw a brand new car covered on a truck. They invited us to join them. Like everyone else it seemed, we left one evening at 9pm. The first part of the piste was terrible, about 100 km. of very soft sand. After one hour we had only covered about 500 metres and could still see the lights of Tajarhi behind us. The others seemed unruffled and unbelievably navigated following a single star. There were no tracks. After two hours the conditions improved so were able to keep moving. Suddenly, while we’d stopped to check the engines five military Toyotas pick ups fitted with machine guns tore out of the darkness and surrounded us. Catherine and I nervously listened to them talking over the radios and at this moment thought our trip was at an end. But after a brief talk with the others and some shaking of hands we were allowed to continue. Clearly some arrangement had been made. In fact the army knew the smugglers, because we saw one of the soldiers the day before taking money from the Toubous. The reason stopping us in the night was in my opinion to show they could find us anyway, even in the middle of the desert at night. So leaving without their permission would be impossible. The drive to Madama unfolded exceptional landscapes and every day we met yet another overloaded truck taking Africans to Libya. It’s not a highway but there is traffic anyway We ended the next day just before Madama where we spent the night with the Toubous. In the morning we drove up to the military post and handed over our passports. At long last, after several weeks we were officially in Niger! At Madama we met up with a big Slovenian truck carrying eight tourists and we decided to continue with them as we still had another 500 km to get to Dirkou. Their truck was an old military TAM, about the size of a new Unimog, but with only 120 PS for 10 tonnes! On the way south we passed through two more military check points in Dao Timmi and Dirkou. In Dirkou we met the famous fuel dealer Jerome the Libyan who sold us diesel in 205-litre drums. Luckily we were able to share it with the Slovenian truck as we had no room for so much fuel. Jerome is a very strange and funny man, he is about 84 years old and tells stories about the second World War during the battle with Rommel and Montgomery in Tobruk. He has lived in Dirkou since 1958. We rested two days in Dirkou during which time we checked over our vehicles and visited the very nice market. Eventually we managed to find a guide to take us across the Ténéré to Agadez. Mohammed Toufoutou was very good but expensive, charging 1500FF for the 650km trip no matter how long it took. The Ténéré seemed to us very easy driving. We had the impression that it was very flat and only once in a while did we hit patches of soft sand. Some of the parts were so flat and featureless it was hard to keep in a straight line. The guide was incredible. We drove 250 km straight to the Arbre du Ténéré which we found a very dirty place, but anyway we saw it. On our way to Agadez we passed many Africans going north to Libya to find work, perched on the top of big 6×6 trucks overloaded to the hilt. Very impressive were the salt caravans, some of more than 200 camels heading for Bilma via Arbre du Ténéré and Fachi: 450 km in just fifteen days. At one stage they have to cover about fifty kilometres a day through the dunes to get between the wells of Arbre du Ténéré and Fachi. When the camels leave Tazolé (160 km east of Agadez) apparently they can become nervous. We saw many dead beasts that did not make it to the next well abandoned by the piste. The second day, about 200 km from Agadez, the Slovenian truck’s alternator expired. Three times I had to tow-start it to get the engine running. Later when I noticed the whole roof of the BJ shaking, I realised pulling the 10-ton truck over the sand had torn away the rear chassis cross-member. Arriving in Agadez there was a good ambience but as we were the only tourists, they all jumped on us to sell something. Having made our repairs the Slovenians found someone to drive with them to Arlit and on to Tamanrasset. From there they planned to continue back up to El Oued and Tunisia. We were going south to Togo, so we said our goodbyes. How they did work out, I don’t know, but I knew that together we had done something special. We were very pleased with our achievement, to have crossed the Sahara and the famous Tenere from Libya to Agadez. I surely want to do it again sometime! Last October I travelled from Libya to Niger with my girlfriend. We had a 15 year old Nissan Patrol diesel. We bought our Niger visa in Sebha (100 dinars each). It took just half an hour. We did not take the carnet as we thought 250 dinars was too expensive. In Gatrun we stayed in the old Italian fort which is something of campsite now. Some bad stories circulate about the owner Mohamed Tahar, but I think he’s really okay. We paid 35 dinars search for the formalities. Staying at the fort was free. Mohamed Tahar offered to organise a guide for the trip to Niger, but did not bother when we said we didn’t need one. We left Gatrun alone, two people in one car. The sandfield just after Tajarhi is easy with 0.5 bar in the tyres. We drove on the truck piste and saw about four other cars every day. We did not follow the old Marlboro-piste, but drove 20km further west. We reached Tumu in two days and then drove on to Madama, where we were met by some nervous soldiers who initially seemed to think we were Tubu rebels. We bought insurance for 450 FF. Still alone we continued to Dao Timni, Seguedine and Dirkou. The piste was clear. Only shortly after Madama we took a wrong branch, and probably arrived on a smugglers piste. We did not really know if the real piste was to the west or to the right. We decided to stop for the night and watch for trucks. In the night it’s much easier to see cars passing by. At the beginning of the night we saw them miles away to the west. So then we knew we had to go west in the morning. We slept well. We arrived in Dirkou early in the morning, two nights later. We met Jerome and bought petrol with loads of sand in it. We ate something and left in the afternoon. No one told us to take a guide. If we had stayed in town longer, things may have turned out differently. We crossed the Tenere on the truck piste via Achegour. A lot of soft sand, but our Patrol did not have any problems, even without sand tyres (we had 215 R 16 Bridgestones M&S!). Agadez was calm. We bought a carnet for 50 FF and continued south. We drove to Niamey, Gao and Bamako There we wanted to sell the car, but no one was interested. So we decided to continue to Nara, Nema and Nouackchott. Finally we sold the car in Dakar for 12.000 FF (the same price we paid in the Netherlands). I don’t think it was dangerous to do Libya-Niger with just one car. Local truck-drivers do the same. As long as you stay on the tracks nothing can go wrong. Tuareg-rebels do not seem to be a problem anymore. 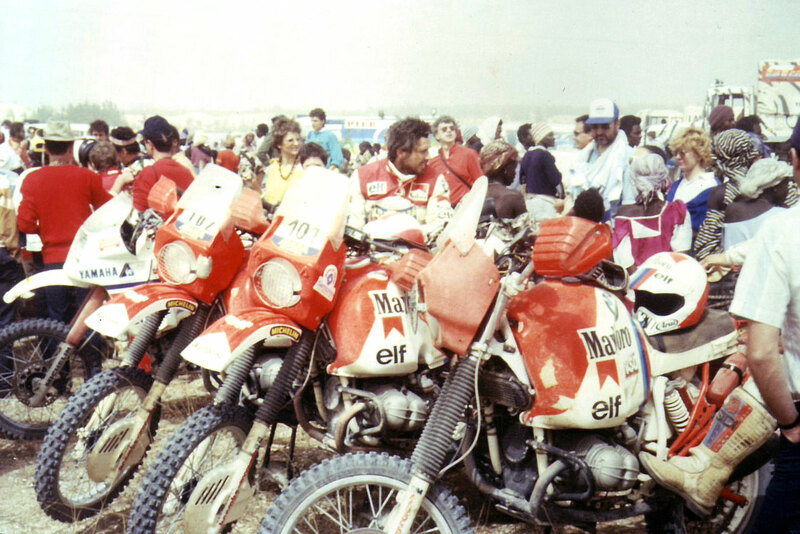 Although I wonder what’s going to happen to the Paris-Dakar when they travel through the north of Niger in January 2000. I suppose some people will get robbed. The target is just too easy. This entry was posted in Desert Babbles (blog), Sahara A to Z... and tagged Achegour, agadez, Al Gatrun, Arbre du Ténéré, Bilma, Dao Timmi, Dirkou, Fachi, Gatrun, Jerome the Libyan, Libya to Niger, Madama, Marlboro piste, Mohamed Tahar, Mohammed Tager, Seguedine, Tajarhi, Tazolé, tenere, toubou, Toubous, tubu, Tumu, Wadi Alhikma Travel on May 18, 2015 by Chris S.